Prague's public transportation system is one of the best in Europe and the whole world. The fastest way to transport yourself around Prague is using the underground subway 'Metro' system, trams & buses. Here is an overview the Metro lines. 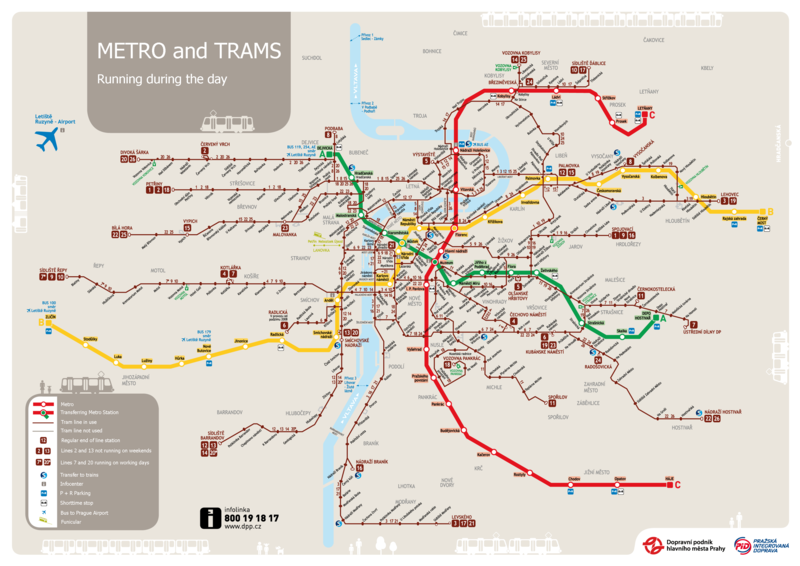 Click HERE to view the full map of Metro system & trams. It is important to note that the metro during the night (from 12' midnight) is closed. It is best to use night trams and buses. Click HERE to view a full map of night trams & buses. For your safety and preventing yourself from being overcharged for a taxi ride in Prague, we reccomend you to use service of only market cars and with drivers that display there license. Idos.cz allows you to search a suitable route with the use of public transportation in Prague, the Czech Republic and international routes too. For transportation around other Czech cities and towns, it is possible to use bus & train service. For traveling within Czech Republic and across international borders we recommend you to take the best transportation service company. Student Agency - modern buses & trains, guaranteed best comfort and quality of service for the best price.